TORONTO, ON – In an announcement released exclusively to Canadian Beer News, McAuslan Brewery has revealed that for the second year in a row, St-Ambroise Russian Imperial Stout will be put on tap simultaneously at a number of bars across Ontario – this time marking a milestone anniversary for the brewery. 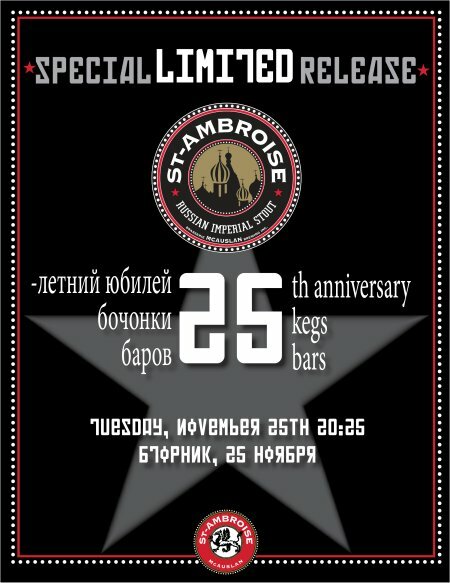 On the evening of Tuesday November 25th, the “25th Anniversary, 25 Kegs, 25 Bars” event will take place at establishments across the province, with a synchronized first pour at 8:25 PM. This will be an especially unique opportunity for Ontario beer drinkers to try this year’s edition of St-Ambroise R.I.S., as the LCBO has declined to stock it, meaning bottles will only be available via private ordering. The 25 bars taking part in the promotion will be announced here on CBN next Monday November 24th at 11:00 AM.